Review by Max Headroom of Vail, AZ. This adapter was for placing a GSO crayford focuser on my old widestar 127 refractor. 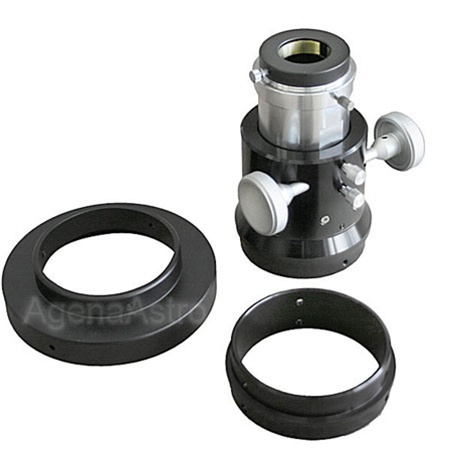 There have always been collimation problems because the stock focuser assembly did not fit well and was shimmed with some cloth tape, and would shift sometimes.. Although it's not perfect, the new plate does not shift and is better centered. Review by Dave of Southeast PA. I got the A150 adapter for my Celestron 150 f/5 OTA (Omni XLT 150 R). I like this tube for wide starfields, and I wanted a better focuser than the Synta unit that is standard. I had the focuser, I bought the adapter, and now I am a happy observer. One plus I hadn't expected is that I can put in my binoviewer, and with the focuser racked all the way in, I can get focus WITHOUT any optical compensation (I have focusable diopters.) This gives me the widest fields with no fuzziness at the edge of the field. That makes this a doubly good upgrade. Overall, I am pleased with this adapter and Agena's service. An "Adapter is an Adapter" is not always true. These are very well-made, with the pre-drilled holes in the right places. I'll definitely be using another one when I upgrade a focuser.